Great for anyone who is trying to understand what is going on in society. Great for historians and analysts. A great buy if you do not have the time to read all 100 plus trends online . The Lights can go out any time, history can be manipulated anytime but trends cannot. Give yourself the opportunity to read what really happened in 2017-2018. You need to know before it is re-written. Pre- Purchase the hardcopy print today. This Book will be available after June 2018. Investigative reporters around the world come forward with the wildest trends out there. Explained and Unexplained recent 2017, 2018 events and trends. Individuals and citizens around the world with bizarre real stories. 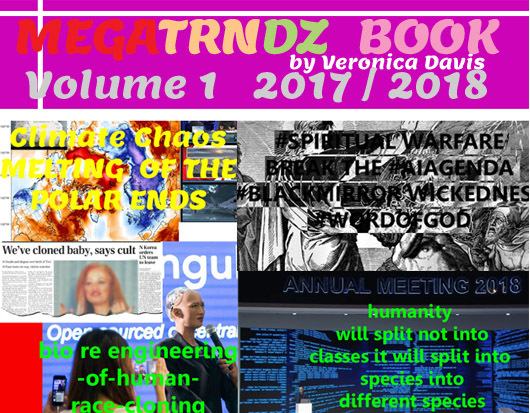 Megatrndz.com covers all trends that the social media has picked up on that is why Megatrndz Book Volume 1 2017- 2018 by Veronica Davis will soon be published. How important is it for you to own one. Megatrndz.com does not support trends that do not have credibility. Believe it or not Fake News is a category in itself becoming the latest trend beginning at the end of 2016 during the Donald Trump Election. Megatrndz does not support Fake News from various sources in which it will claim its discourse. Fake News was created to keep the truth from being spread. Megatrndz.com understands the basis of what is truth to the believer and those who are the faithful believers of the Lord and Jesus Christ. Even Jesus Christ said that he spoke the Truth.